Do 'eyelid seatbelts' intrigue you? Of course they do. Find out why this strange anatomical feature allows woodpeckers to smack a tree with their faces thousands of times a day without breaking themselves to pieces. 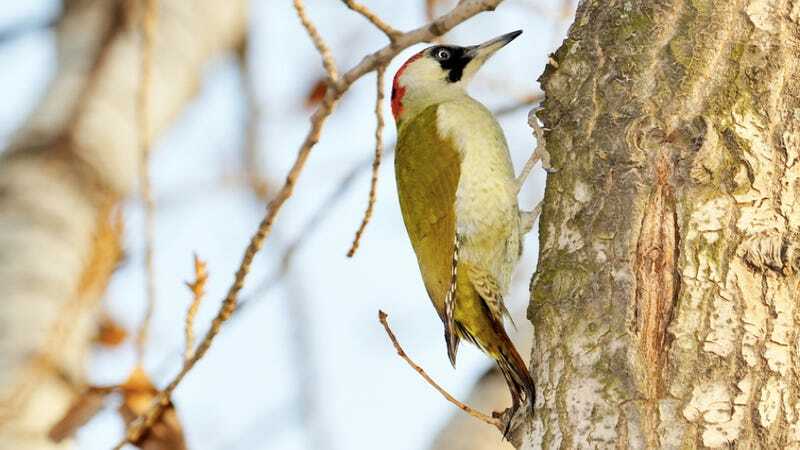 In 2006, ornithologists Ivan R. Schwab and Philip May set out to study the apparently unbreakable heads of woodpeckers. These birds hammer their beaks into tree trunks searching for insects about, with about 500 strikes a day being typical. During the mating season, when males want to show off their, ah, drilling skills, they will slam their heads into a tree about 12,000 times a day. Each slam has a deceleration force of about 1200 g. A human will concuss themselves at 100 g.
How does the woodpecker do it? Mostly, it seems, by going against what most people assume about concussion prevention. Humans have hard heads, supposedly to ward off shocks, and a layer of fluid around the brain, supposedly to cushion it. Although humans do benefit from their hard skulls and the fluid, the woodpecker takes a different approach. It has a spongy skull that surrounds the brain neatly, with no fluid cushion. The brain can't splash around, moving freely through fluid if the hit is hard enough, the way it can with humans. One of the main things the woodpecker has, though, is control. Not only can it time its eyelids perfectly (and I can't stress enough how crucial this is), it always strikes the wood dead-on, with no twisting or bending. Sudden twists or turns often result in the kind of injuries that cause concussions in humans. The brain accelerates or decelerates too fast. The twisting can also cause extreme stress on car, plane, or other industrial parts. Now, scientists are using this research to figure out rigid, linear systems that reduce shock to mechanical parts in machines. They're also attempting to find better ways to protect football players and other athletes from concussions. One day, a design borrowed from a woodpecker's head may save your life. And your eyeballs.